Nothing complements the flavor of lamb better than rosemary. And our Quick Broil method makes this dish very fast and easy to prepare. With this dish you not only enjoy great taste but add an excellent source of protein, vitamin B12, selenium, zinc, and vitamin B3 to your Healthiest Way of Eating. Enjoy! Mix together lemon juice, rosemary, pressed garlic, salt, and pepper. 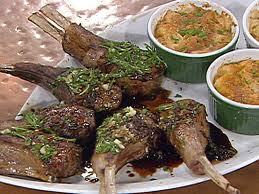 Rub lamb chops with mixture. Set aside on plate. Preheat broiler on high heat, and place a stainless steel or cast iron skillet large enough to hold the lamb chops under the heat for about 10 minutes to get very hot (about 5-7 inches from the heat source). Be sure that the handle is also metal. Once pan is hot, place lamb chops in pan, and return to broiler for about 4-5 minutes, depending on thickness of lamb. Lamb is cooked quickly as it is cooking on both sides at the same time. This is our Quick Broil cooking method.